Home » Can Turmeric Really Improve Your Workout Recovery? The active ingredient in turmeric has solid evidence as a means to fight muscle soreness. Have you heard? Turmeric is spicing up the wellness and fitness world. 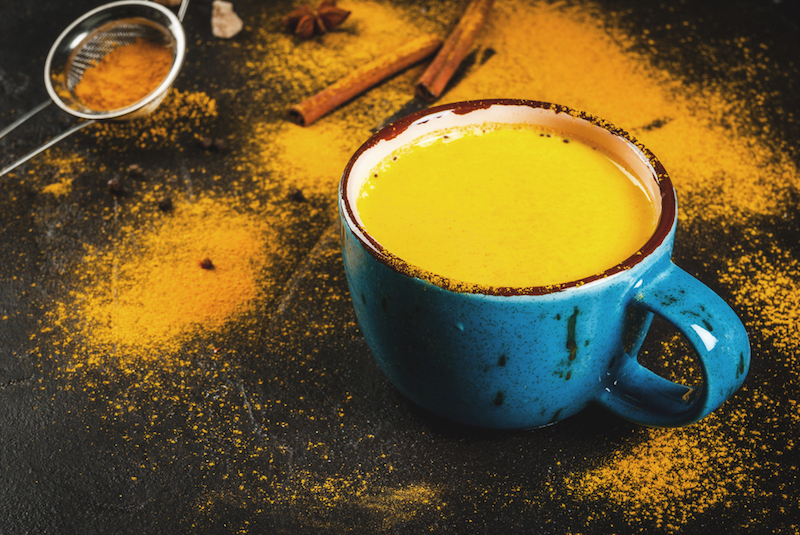 Commonly known as a spice that’s used in many Asian and Indian dishes, turmeric has gained new-found fame in “wellness” drinks and tonics (#goldenmilk) and even beauty products. A Google report states that the search for “turmeric” achieved a 300% growth in 5 years, with top associated searches including “powder,” “smoothie,” “recipe,” and “drink” (1). It is also widely used as a dietary supplement to help alleviate pain in individuals suffering from arthritis and musculoskeletal conditions, as well as providing relief of stomach problems like indigestion. But could turmeric be something you could add to your sports nutrition stack to help with workout-related inflammation? Here, we look at few research on curcumin and exercise and explain the science behind why it has become a go-to for many gym junkies. Turmeric, a member of the ginger family, is acquired from the Curcuma longa plant, a native to tropical regions in India and Southeast Asia (2)(3). Historically, turmeric was widely consumed to treat various human ailments in ancient Ayurvedic practice going as far back as 5000 years ago. It was not until about two centuries ago in 1815 when two German scientists Vogel and Pelletier reported the isolation of a “substance that gives the yellow color” from the rhizomes of the turmeric plant, marking the discovery of turmeric’s active ingredient called curcumin(3). Indeed, numerous studies have suggested that curcumin may have protective and preventive effects against many diseases linked to inflammation including cancer, diabetes, arthritis, cardiovascular diseases. While we know that resistance training goes a long way in building lean muscle mass and therefore is favored by many athletes. The flipside is when done improperly, it can cause muscle damage that can negatively affect athletic performance. This is especially true when recovery periods are short eg. in consecutive training sessions and competitive sporting events (5)(6)(7). Damage to your muscles and tissues initiates inflammation, which is a vital and normal response of our body’s immune system to stress. 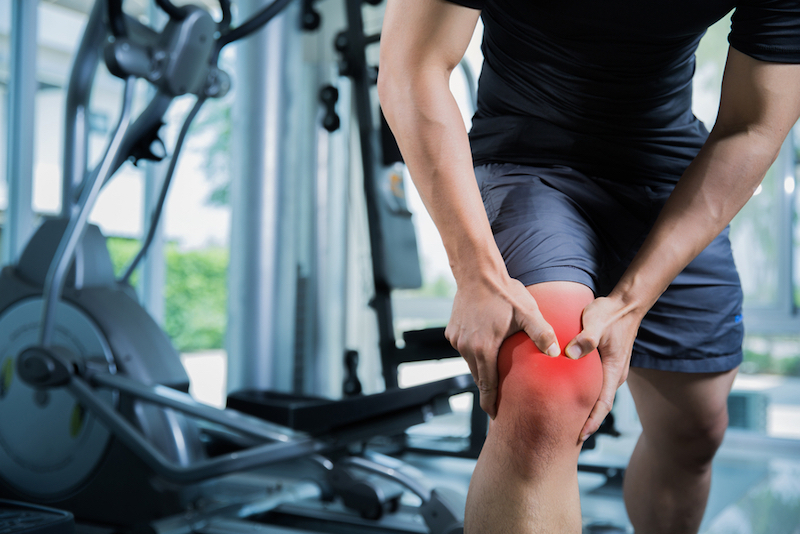 While some inflammation can be good to help with muscle repair and adaptation (that’s how you gain strength), secondary muscle damage due to uncontrolled inflammation, particularly when eccentric (lengthening) muscle activity is involved, can cause many undesirable effects. These include decreased muscle strength and range of motion, swelling, and delayed-onset muscle soreness (DOMS) a.k.a muscle pain and stiffness. Generally, DOMS and inflammation is the highest between one and two days following a resistance training session (7), and for many, the first instinct is to seek to an Advil or any NSAIDs for relief. Despite the perceived benefits of NSAIDs, emerging controversy about their potential adverse effects — like digestive issues and insomnia when used long term — has sparked a public interest in more natural alternative with anti-inflammatory actions. As such, curcumin has received special attention because it is believed to behave the same way as NSAIDs but with a less pronounced inflammatory effect(7). In the cell, curcumin exerts its antioxidant effects by suppressing the molecules and pathways that are responsible for triggering the inflammation cascade. It is believed that improved inflammation control may translate to faster muscle recovery and enhanced functional capacity. 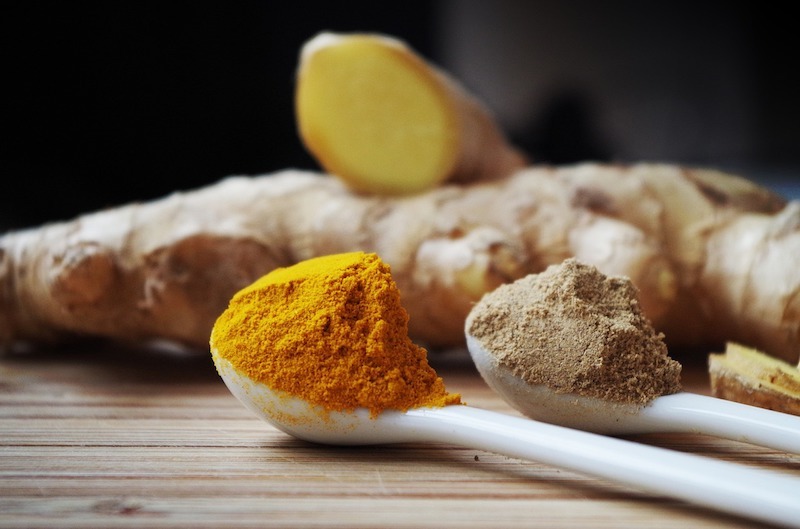 These observations prompted researchers to investigate whether curcumin could play a role in lessening the effects of muscle damage and inflammation caused by eccentric exercise (downhill running) in twenty healthy, moderately active males (8). A European Journal of Applied Physiology study followed suit by conducting a more robust, double-blind, randomized-controlled design (9). Both studies reported that consuming curcumin 2 days before to 3-4 days after exercise improved DOMS. Subsequently, another study used an “optimized” form of curcumin supplementation in their study, (meaning it would translate to higher bioavailability in the body, more on that later), and found that curcumin reduced inflammation and markers of muscle damage (measured by creatine kinase activity in the blood) caused by exercise (7). What’s the Best Time to Take Curcumin? 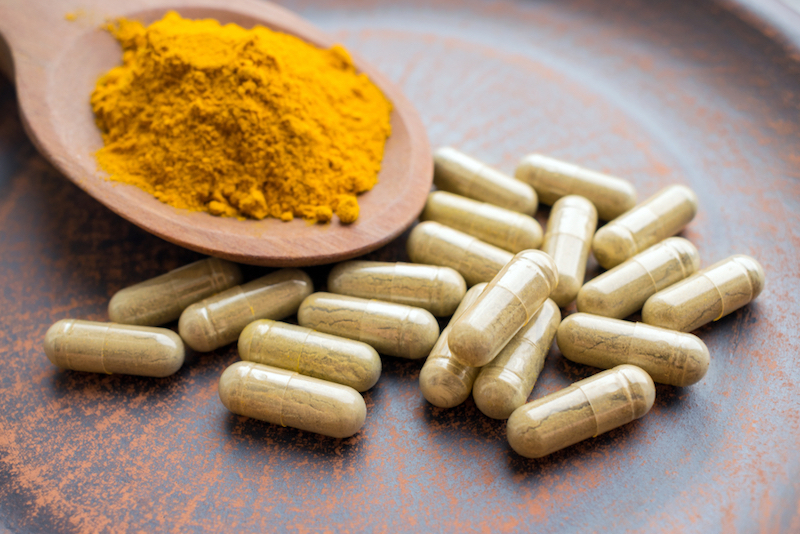 Collectively, these studies reported promising effects of curcumin use before and after exercise in reducing the side effects of muscle damage, but it is unclear whether the timing of intake may play a role in the proposed benefits. To answer this, a recent study by Scandinavian Journal of Medicine & Science in Sports earlier this year reported that curcumin ingested 7 days after exercise may contribute to faster recovery of exercise-induced muscle damage (5). An added bonus? Curcumin supplementation 7 days before eccentric exercise was shown to lessen inflammatory responses. While turmeric could come in handy and be part of your dietary routine to help enhance post-workout recovery, it is important to note that like all other dietary supplements, there are no established guidelines on its use and shouldn’t be relied on as the only method of recovery. Additionally, those who are very enthusiastic about taking curcumin as a complementary or alternative medical approach should first consult to their healthcare professionals to determine if it’s appropriate. Note that doses in these studies vary from 100 milligrams to 2.5 grams of curcumin per day, and since a gram of turmeric has about 30 milligrams of curcumin, you’ll want at least two teaspoons of turmeric (four grams, or 120 milligrams of curcumin) if you want to supplement with the herb itself. If you want to guarantee a bigger dose, you might be more interested in dedicated curcumin supplements. Research has suggested that the health benefits of curcumin are more pronounced when being included as part of a Mediterranean dietary pattern high in fruits and vegetables (10). Another noteworthy thing about turmeric is that because of its limited absorption in the body, it may be helpful to pair turmeric with black pepper as piperine, a compound found in black pepper can boost curcumin’s absorption in the body by up to 2000% (11). Because curcumin is fat soluble, consuming turmeric alongside foods that contain some healthy fat is also another trick to reap those (golden) benefits (12). Thanks to modern science, several formulations have been developed to enhance the absorption of curcumin supplements, for example one that can dissolve rapidly when ingested, and a lecithin (fat based) formulation. Pina P. 2016 food trends from google search data: The rise of functional foods. Think with Google Website. Updated 2016. Javeri I, Chand N. Curcumin. In: Gupta R, ed. Nutraceuticals efficacy, safety and toxicity. Elsevier Inc.; 2016:435-445. Sahebkar A. A systematic review and meta-analysis of randomized controlled trials investigating the effects of curcumin on blood lipid levels. Clin Nutr. 2014;33(3):406–414. doi: 10.1016/j.clnu.2013.09.012. Tanabe Y, Chino K, et al. Effects of oral curcumin ingested before or after eccentric exercise on markers of muscle damage and inflammation. Scand J Med Sci Sports. 2019;29(4):524-534. Tanabe Y, Maeda S, et al. Attenuation of indirect markers of eccentric exercise-induced muscle damage by curcumin. Eur J Appl Phys. 2015;115(9):1949–1957. doi: 10.1007/s00421-015-3170-4. McFarlin BK, Venable AS, et al. Reduced inflammatory and muscle damage biomarkers following oral supplementation with bioavailable curcumin. BBA Clin. 2016;5:72–78. doi: 10.1016/j.bbacli.2016.02.003. Drobnic F, Riera J, et al. Reduction of delayed onset muscle soreness by a novel curcumin delivery system (Meriva®): a randomised, placebo-controlled trial. J Int Soc Sports Nutr. 2014;11:31. doi: 10.1186/1550-2783-11-31. Nicol LM, Rowlands DS, Fazakerly R, Kellett J. Curcumin supplementation likely attenuates delayed onset muscle soreness (DOMS) Eur J Appl Physiol. 2015;115(8):1769–1777. doi: 10.1007/s00421-015-3152-6. Esposito T, Schettino C, et al. Synergistic interplay between curcumin and polyphenol-rich foods in the mediterranean diet: Therapeutic prospects for neurofibromatosis 1 patients. Nutrients. 2017;9:783. doi: 10.3390/nu9070783. Gupta S, Patchva S, Koh W, Aggarwal B. Discovery of curcumin, a component of golden spice, and its miraculous biological activities. Clin Exp Pharmacol Physiol. 2012;39(3):283-299. Purpura M, Lowery RP, et al. Analysis of different innovative formulations of curcumin for improved relative oral bioavailability in human subjects. Eur J Nutr. 2018;57(3):929–938. Hennis is a New York City-based Registered Dietitian (RD). She earned her Bachelor’s Degree in Food Science and Nutrition from the Ohio State University, before completing her Dietetic Internship and Master’s in Clinical Nutrition from NYU. She started her career as a clinical dietitian in NYU Langone Medical Center followed by Mount Sinai St. Luke’s Hospital. She has extensive experience working with both adults and children on a wide range of medical conditions, including gastrointestinal disorders, diabetes, food allergy/ intolerance and weight management.Hennis’s deep love for food stems from her childhood and also having travelled to various places in Asia, Europe and the United States. Her favorite childhood memories are having home-cooked family dinners every night, and taking the first bite of her mom’s freshly baked bread. She is an adventurous eater who enjoys trying out new cuisines and flavors, and is fascinated by culinary traditions and customs. She recently fell in love (unexpectedly) with canned sardines in Portugal.